In a previous post have been exposed a general method to reduce the number of etching baths and rationalize the relationship between the total etching time and the partial etching times in the respective baths. Here we will analyse a sequential fine tuning of a couple of ferric chloride baths having previously determined a total etching time. This total time its been derived from a deep black just before the open bite. In this case of study, the total etching time employed is of 24min at 20ºC. All figures are only informative. Any change in the method could require quite different values. The method to apply the sensitizer to the carbon tissue, the concentration of the sensitizer, the kind and strength of UV light, the distance and exposure time, the thickness of the glass in the vacuum contact press, the aquatint or screen used, etc., are decisive affecting the final couple of ferric chloride baths needed. 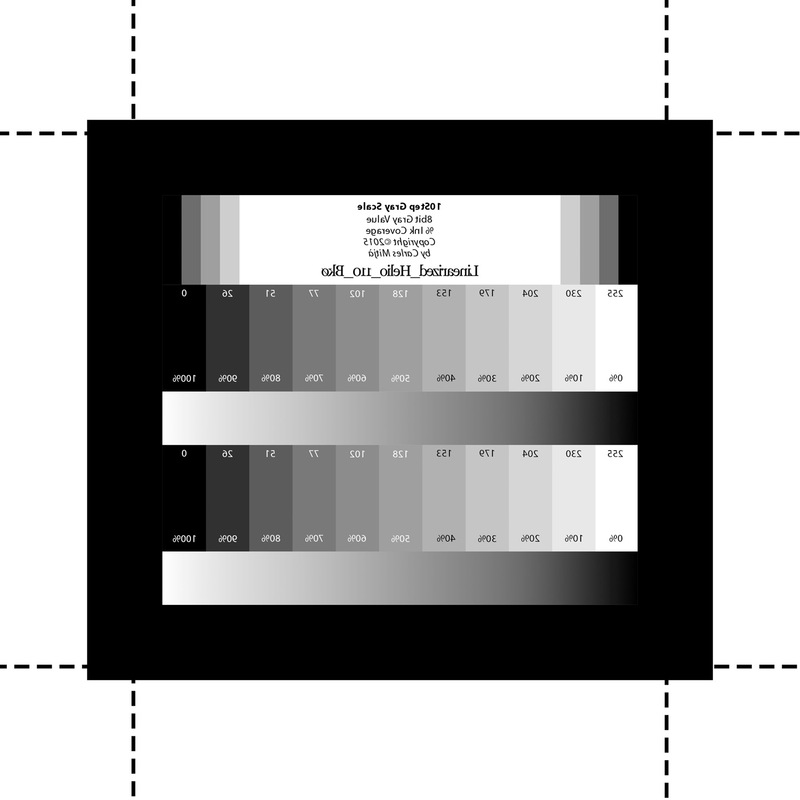 A suitable test target with eleven steps from pure black to pure white (Fig., 1) is printed with the same printer and settings employed to print the positive transparencies on Pictorico OHP film. The necessary time is allowed to completely dry the printed ink. In my case, a minimum of 12h at ambient temperature. This is an important step in order to ensure a consistent density range. Figure 1. Suitable test target with eleven steps from full black to clean white. Observe the upper legend indicating the correction curve applied in Adobe Photoshop CC; this helps to record the given conditions both in the plate and in the final print. Dashed lines are indicative of the copperplate size, while the black frame ensures the correct adherence of the gelatin in the margin area when it is transferred to the copperplate surface (click on the image for an enlarged version). The printed test target density range is measured with the aid of a transmission densitometer. A total etching time of 24min at 20ºC has been determined as is explained in Heliogravure V – About Etching. An ideal exposure time has been determined through an exposure of the Stouffer T4110 test target. The time is adjusted to achieve a correct exposure revealing a number of steps equalling the optical density range of the previously described test target. 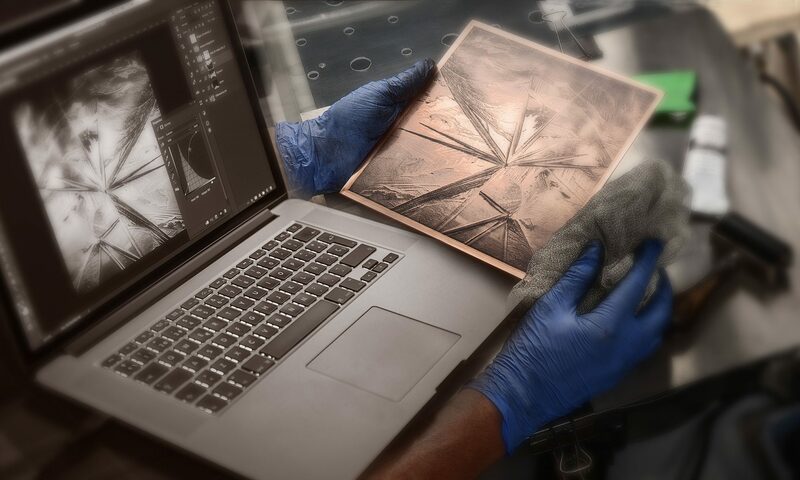 A piece of carbon tissue is exposed both to a screen and to the test target, adhered on a copperplate, washed out, dried and etched as usual. In this case, the respective etching time in each ferric chloride bath is determined as is explained in Heliogravure V – About Etching. The actual beginning of the etching time is monitored by an accurate observation through a magnifying glass over the black step. Time begins to count on when the first signs of etching appear on this step. Depending on both ambience temperature and relative humidity, this occurs between three or four minutes after the plate is submerged in the ferric chloride bath. After etching is finished, the plate is inked, wiped and printed on paper. The dry print is then scanned on applying a linear transference curve. The resulting digital file is measured. The measure is performed with the rectangular selection tool of the digital image processing software ImageJ on each test target step. The averaged pixel value is then transferred to a spreadsheet. Affordable and free software to perform this kind of measures is the mentioned ImageJ and the Open Office spreadsheet. A graph is generated comparing the actual printed test target steps values (blue) with an ideal progression of values (red). Accordingly with the results, the complete assay is repeated changing the concentration of the ferric chloride bath and sometimes, the exposure time. The sequence of exposures, etchings and reasoned decisions for the example is shown in the Fig., 2. Figure 2. Series of graphs generated from corresponding modifications on the exposure time and/or the ferric chloride concentration. See complete explanations in the text body (click on the image for an enlarged version). Upper left. With the first couple of baths, 44ºBé and 43ºBé, the plots shows as after 24min of etching, the 43ºBé bath has been unable to penetrate the last four steps at the highlights extreme of the test target. Upper centre. Diluting the second bath to 42.5ºBé, the plot shows now as the ferric chloride has penetrated all the test target steps. Nevertheless, the linearity is still far away from the ideal red straight line. Upper right. Two minor changes have been applied here. The exposure time for the positive transparency has been slightly extended by reference to the screen exposure time, while the second bath concentration is lowered to 42ºBé. The plot shows a slightly better distribution of the shadows steps. Extended exposure time prevents the quick etching of shadows because of the more diluted second bath. Bottom left. Maintaining the previous exposure times, the second bath concentration is now lowered to 41.5ºBé. While the blacks are still too lower, the medium and highlights steps are almost linear from 0 to 60% of ink coverage. Here we could take two ways. A first approximation may be change the concentration of both baths. A possibility would be 44,5ºBé for the first and come back to the 42ºBé for the second. Another option is to take advantage of the mentioned linearity correcting only what is away from the red line, but with the same couple of ferric chloride baths. This can be achieved applying a correction curve to the test target and printing it again. Bottom centre. 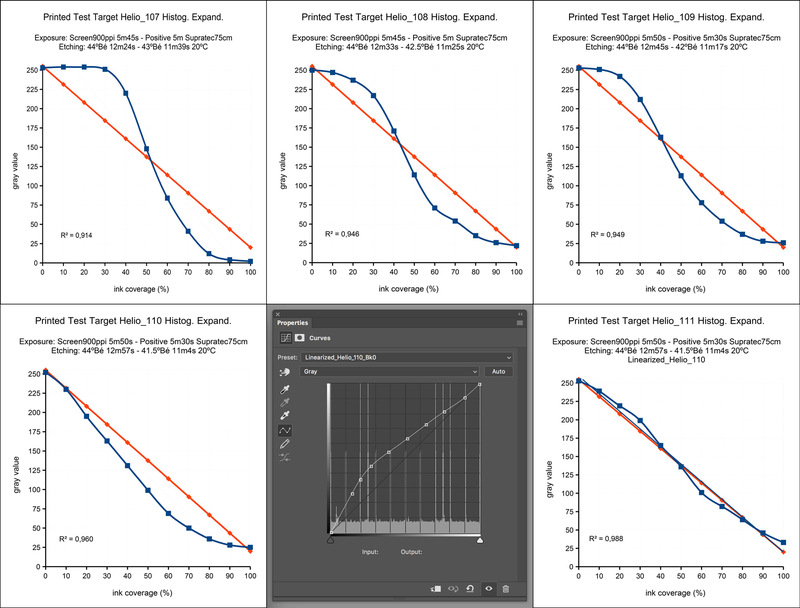 Correction curve applied to the test target in Adobe Photoshop CC. The curve has the shape inverse of the observed in the previous spread sheet plot at bottom left. Bottom right. With this correction, now the plot is almost linear all over the steps range. Minor fine tuning can be still applied, but in terms of visual perception, we can assure that there will not be a noticeably departure from the original tone in the printed picture. Note specially as each time the concentration of the etching baths is changed, they are also changed the respective immersion times. The factor governing this necessary weighting to compensate the difference in etching activity is explained in Heliogravure V – About Etching and is derived from graphs published by Herbert Mills Cartwright (1). Note also that the respective etching times are calculated by an spreadsheet and this results in not always practical figures. As an example, the last 12min 57s(44ºBé) + 11min 4s(41.5ºBé) can be rounded to 13min(44ºBé) + 11min(41.5ºBé). From previous explanations can be derived that in order to follow this two baths etching method it is necessary accurately measure the ferric chloride concentration. This can be only accomplished with the appropriate Hydrometers. The Fig., 3 shows two type of hydrometers both calibrated to measure at a 20ºC temperature. The shown at bottom measures from 0ºBé to 50ºBé with an accuracy of 1ºBé while the shown on top measures from 40ºBé to 50ºBé with an accuracy of 0.1ºBé. This one is the needed for the proposal of previous text. Figure 3. Two hydrometers calibrated to correctly measure in ºBé at 20ºC (click on the image for an enlarged version). It should be emphasized that any measurement with this devices is only suited to correctly work at a given temperature. 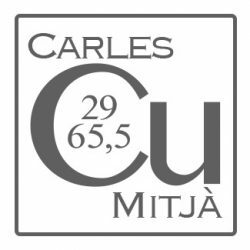 In this case, as the hydrometers are calibrated for 20ºC, this is the temperature maintained in the process to prepare the different concentration ferric chloride baths and also along the complete process of etching. This is not specially difficult in winter with a suitable heating installation. At summer, it is not so easy to regulate the ambiance temperature as low as 20ºC without a powerful, expensive and high energy consuming air conditioning installation. Nevertheless, if the ferric chloride dilutions have been prepared in the cold season, the only one limitation to be overcome is the refrigeration of the ferric chloride trays just the time necessary for the etching. Reducing the number of baths helps also with these constrains. Specially with plate sizes up to 24x30cm, a simple circulating refrigerator can be obtained from a couple of Peltier’s plates connected to a 12V power source. 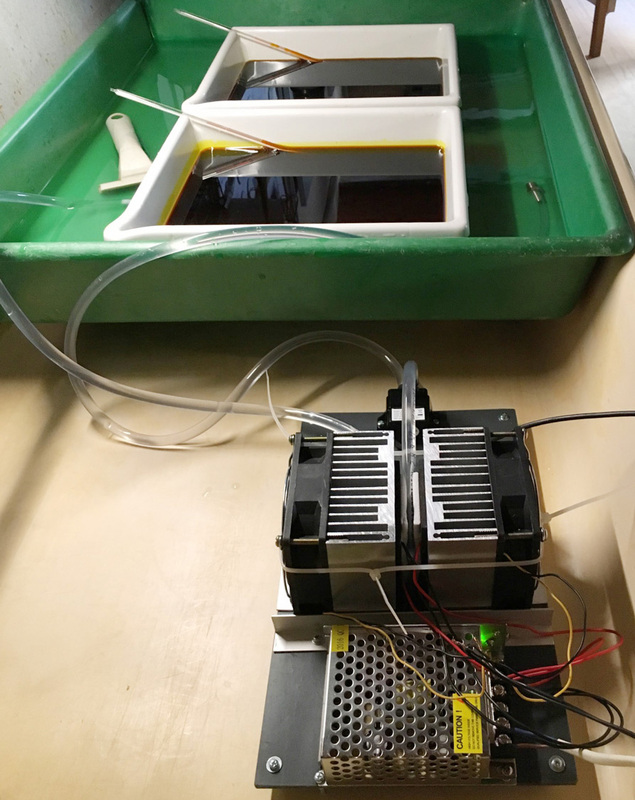 The Fig., 4 shows an installation with a water bath circulating through the Peltier’s plates and refrigerating the couple of ferric chloride trays. With accurate thermometers immersed in each ferric chloride bath it is quite easy to control the actual bath temperature. Figure 4. At background, the two etching baths immersed in a circulating water bath. At foreground, Two Peltier’s plates connected to a 12V power source. The water bath is forced to circulate by a fish tank pump through the Peltier’s plates. The more the plates are refrigerated by its respective fan, the lower is the temperature achieved in the inner face of the Peltier’s plate. This procedure, accurate and simple, allows the user to concentrate its effort in the imaging part of the whole process. In my opinion, as better controlled are the technical steps, better is the freedom for the creative process. CARTWRIGHT, H. M. (1961) ILFORD GRAPHIC ARTS MANUAL Volume 1 Photoengraving. Ed. Ilford Limited, Ilford, Essex.